Crystal Acoustics claims energy-saving adapters cut electricity bills | What Hi-Fi? They turn off the power to devices connected to them when they are not in use buy overriding the standby mode. 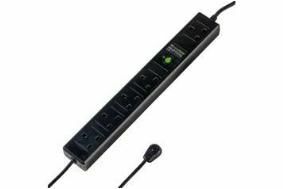 A Load Learning function enables the adapters to 'learn' the standby power level of the connected devices, and then cut off the power automatically . They also have a single 'always on' socket for connecting devices that must always remain powered up, such as a Sky+ set-top box or PVR. And they include surge protection to prevent damage from electrical spikes. There are two models, both costing £14.99: the CES-5R-LL Remote Control and the CES-5S-LL UK. The former allows any device to be switched back on with the use of its remote control, the latter by using a table switch.